For gates up to 5,000 lbs. or 65 ft. in length. This is a Ramset RAM 5700 Commercial Slide Gate Operator. 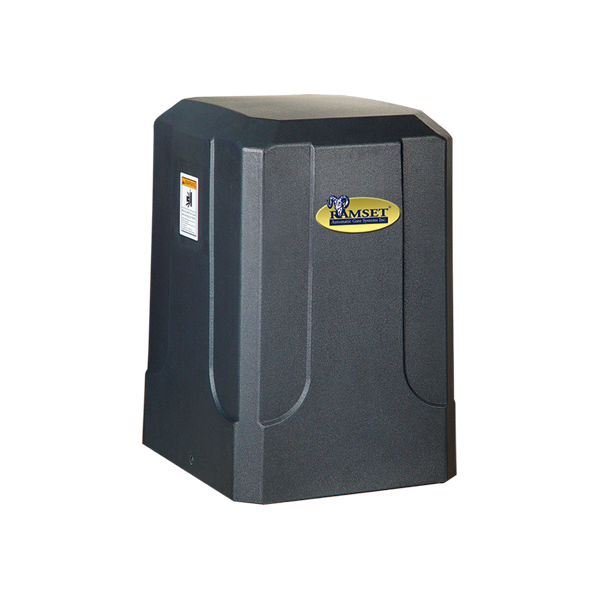 When your heavy gate requires something tough and durable, this unit is the perfect solution. Offering a 1-horsepower continuous-duty motor with the power to open a gate as heavy as 5,000 lbs. Most competitors use two 1/2-horsepower motors with less combined power and efficiency, which is not a good option when power is required. It is designed for heavy-duty industrial and commercial applications only. It is highly recommended by distributors and installers for its low maintenance and durability. You only have to use it once to realize that it is the perfect opener for your gate.